Nintendo of America have confirmed that both Pokémon Black Version and Pokémon White Version are due to release across North America on March 6th, providing fans of the series with a whole new adventure to experience within which they can discover over 150 new Pokémon scattered across the entirely new region of Unova. As with previous titles each version will provide the chance to catch a unique Legendary Pokémon with Reshiram exclusive to the Pokémon Black Version, and Zekrom exclusive to Pokémon White Version. 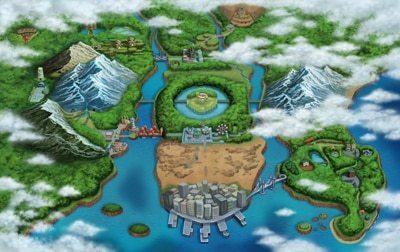 Further to this, each version will also include different areas with Pokémon Black Version featuring a unique metropolitan area called Black City, and Pokémon White Version offering a lush, green area named White Forest. For the first time, seasons will also change in the game world with certain Pokémon appearing more frequently within different seasons. Players will once choose between starter Pokémon, each new to the series; the Grass-type Snivy, the Fire-type Tepig or the Water-type Oshawott. Until the main story of the game is complete, every Pokémon that players encounter will have never been seen before in previous Pokémon games. Both Pokémon Black Version and Pokémon White Version are now available to pre-order from major retailers across North America, at an RRP of $34.99.